Early this morning former Mongolian President N.Enkhbayar was arrested at his home in Ulaanbaatar, Mongolia. The arrest was prompted yesterday when he released classified transcripts from official meetings that took place after the election riots of July 1st, 2008, when four civilians were shot and hundreds of people were injured. The bloody stain on Mongolia’s young democracy is known as the ‘July 1st Incident’. Current Mongolian President, Ts. Elbegdorj is one of many current government officials who are named in the transcripts. This afternoon, Enkhbayar’s supporters gathered in Sukhbaatar Square in front of the government building. They waved flags and listened to party leaders speak, mandating Enkhbayar’s release. Many foreigners were weary to venture outside, but what I witnessed was a largely peaceful demonstration. There were a few extra police on hand, but not many more than are normally patrolling the square. There were Mongolians from all ages and walks of life present – some observing from afar, others yelling and waving their hands in the air. After gathering in the square, the group marched around the government house. However, there are rumors that Enkhbayar’s supporters from around Mongolia will be traveling to Ulaanbaatar in the next couple of days. Protests may escalate and a curfew may be implemented, but as of now nothing is official. 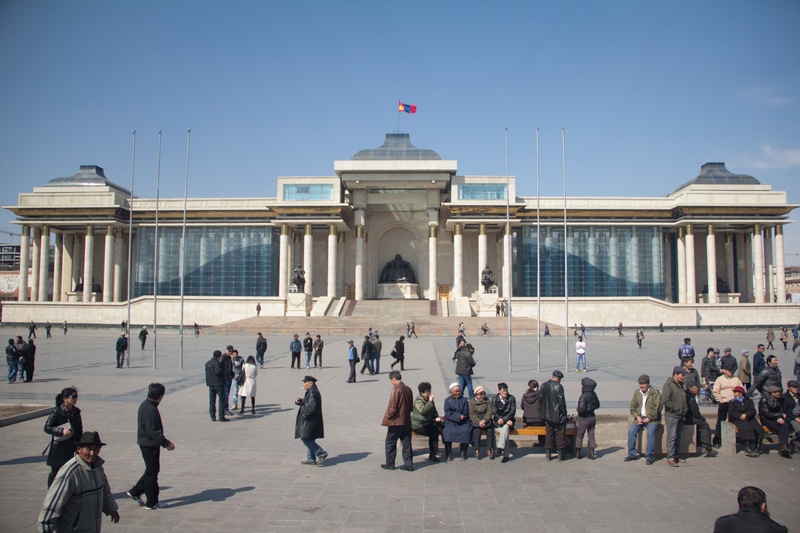 Mongolia’s last legislative elections were held on June 29, 2008. Out of the 76 Parliamentary seats up for grabs, 43 were alledgedly for the Mongolian People’s Revolution Party (the ruling party of Mongolia from 1920 – 1996, just after the Democratic Revolution, and also the party of former President Enkhbayar). The Democratic Party, led by current President Elbegdorj, came in second winning 25 of the Parliamentary seats. That evening anti-MPRP protesters gathered in front of the party headquarters in downtown Ulaanbaatar and set the building on fire. You can still see the charred remnants of the Cultural Palace just to the north which also caught on fire. Police used tear gas and rubber bullets against the angry protesters. Protests continued well into the night, past the police mandated 10:00 pm curfew prompting then President Enkhbayar to declare a state of emergency for the next four days. The army sent tanks into the streets of Ulaanbaatar and the government issued a media blackout. In the end five people, all civilians, lost their lives in the protests. Four were shot by police and one died of carbon monoxide inhalation. The first legislative elections since the July 1st Incident will be held this June. The election process is much shorter than the drawn out marathon we have in the United States, and so many of the candidates have just now started running in their home provinces. Some Mongolians I have casually spoken to about the events in the past 24 hours have said it’s a media stunt by Enkhbayar. Others are not quite sure what to make of it. But almost everyone I’ve spoken with since I arrived in Mongolia has casually mentioned government corruption. Some of the musicians I’ve met with will blatantly call the government out through their lyrics. Others have grown more complacent, quietly acknowledging that they don’t know how it could ever change.